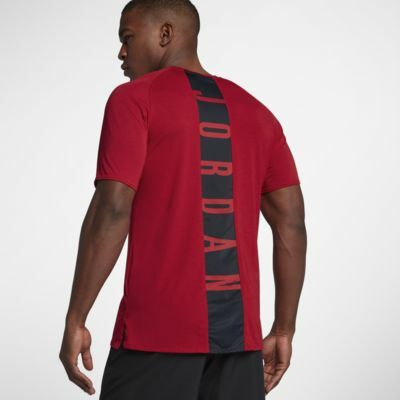 The Jordan 23 Alpha Training Top feels soft and luxurious against your skin, while its performance features help you stay dry and comfortable during your training routine. SOFT FEEL FOR TRAINING HARD. Jersey fabric has a soft, lightweight feel. A mesh back panel enhances breathability. Fabric: Body: 75% recycled polyester/13% organic cotton/12% rayon. Sleeves: 76% polyester/12% organic cotton/12% rayon. Centre back mesh: 100% polyester. Have your say. Be the first to review the Jordan 23 Alpha.